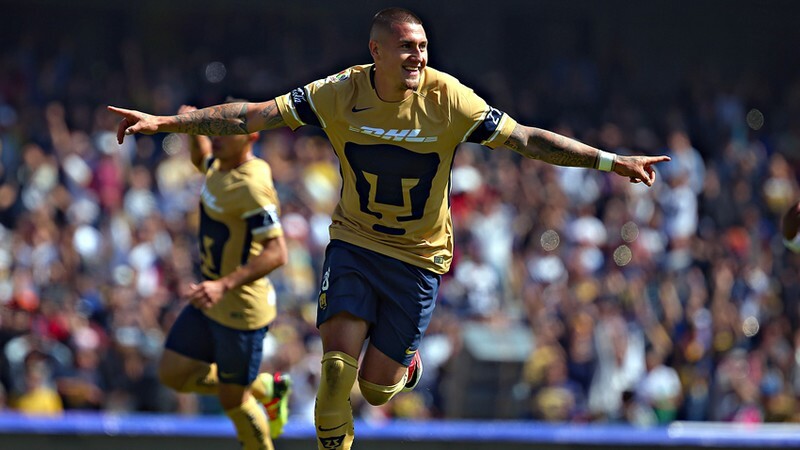 Last tournament, Tom Harrison took you through the best of what happened from each weekend in Liga MX. While Tom gets his FA coaching badges, Steve Graff will take you through the best of each round. A 35th minute goal from Raul Ruidiaz was all Las Monarcas needed to upend La Franja at the Estadio Morelos. From the early going, Las Monarcas were more effective in finding and creating chances, forcing Moises Munoz to make several saves along the way. The 35th minute breakthrough came for the hosts off a change-of-pace throughball down the left wing. The throughball was eventually worked as a low cross to Raul Ruidiaz who finished inside the area to provide the only breakthrough of the game. La Franja were able to attempt more passes and play with the ball more than the hosts, which was a theme throughout the match. But Brayan Angulo and Lucas Cavallini, the players at the heart of their attack, failed to create many chances off of the possession. A long shot from Luis Chavez in the 24th minute was all Xolos needed to defeat Necaxa 1-0, in what was a game of two halves. In the first half, Xolos were the protagonists and generated most of the significant chances, including Chavez’s 24th minute goal on a quickly developed shot that Marcelo Barovero could only parry into the goal. After the break, the Rayos introduced several attacking changes, including former AC Milan midfielder Matias Fernandez, and gained the initiative and generated relatively relentless pressure. But ultimately, nothing ultimately beat Xolos’ goalkeeper Gilbran Lajud. And the hosts were able to preserve a first Liga MX win for new manager Diego Cocca. In the relegation* six-pointer of the round, Queretaro utilized a long passing attack to defeat the relentless Lobos BUAP 2-0 in Puebla. The long vertical pass, which took advantage of Lobos’ numbers to support pressure and possession, and kamikaze commitment to recovery defending, created the first goal for the Gallos Blancos in the 43rd minute when Camilo Sanvezzo latched onto a long ball, beat a defender on the dribble, and opened the scoring on a right-footed shot. And in the second half, a red card handed out to Edson Puch in the 79th minute for covering up a free kick ball gave the Wolves an opportunity at being genuine protagonists. But then, Erbin Trejo finished a counter-attack two minutes from the end of the 90 to give the visitors their first win of Clausura 2018. The defeat leaves Lobos BUAP as one of several teams without a point in the Clausura, and piles pressure onto Rafael Puente Rio should the losing streak continue. With their new signings not in the 18, Club America and Pachuca played out to a combative 2-2 draw at Estadio Azteca. The Aguilas looked to be on a roll early on, when Oribe Peralta converted a hard shot from outside the penalty area to open the scoring in the 13th minute. However, the Tuzos clawed their way back to level terms at 1-1 one minute into the second half, when Oscar Murillo headed a corner kick past an over-committed Augustin Marchesin. After the introduction of Joe Corona to allow Renato Ibarra to play on the attack more, the Aguilas returned to piling on the pressure onto Pachuca’s goal. And in the 75th minute, Henry Martin, another arrival from Tijuana, restored the Aguilas‘ advantage at 2-1 on a finish of Matheus Uribe’s cross inside the area. But the Aguilas‘ lead would be short lived. Two minutes from the end of the 90 minutes, Victor Guzman finished off a knockdown from a free kick inside the area to bring the Tuzos back to level terms. Andre-Pierre Gignac propelled Tigres to their first victory of the Clausura, with the game-winning goal in a 2-1 defeat of Santos Laguna. It was a game that was back and forth, with both teams creating chances on goal from the run of play fairly often. Ismael Sosa opened the scoring for Los Felines in the 21st minute when he put home a rebound off a Gignac shot that Santos Laguna goalkeeper Jonathan Orozco spilled. It ended a seven month goalless streak for the Argentine winger. Tigres kept pushing for a second goal. But in the 53rd minute, Djaniny Tavares Laguneros when he finished off a spilled rebound by Nahuel Guzman off a shot created by Jonathan Rodriguez. But it would be Gignac who would eventually have the final say, finishing a spilled rebound himself in the 68th minute to seal the win for the hosts. The win did not come without a near-scare in the 84th minute, when Julio Furch fired a shot that beat Nahuel Guzman’s reaction, but clattered off the crossbar. While the buzz and controversy around Estadio Leon were mostly focused on Landon Donovan’s arrival in Guanajuato, La Fiera momentarily shot to the top of the Clausura table when they handed a 3-1 defeat to Toluca. From the moment of the opening whistle, La Fiera were in complete control of the match. And 28 minutes in, Elias Hernandez opened the scoring on a shot that beat Luis Garcia. But after losing some of their initiative, Antonio Rios took advantage of a failed clearance by William Yarbrough in the 53rd minute to put the visitors back on level terms. Three minutes later, Luis Montes broke the 1-1 deadlock with a header inside the area to put La Fiera back in front at 2-1. And in the 73rd minute, Fernando Navarro sealed the win for the hosts in style with a chip from just inside the area that caught Luis Garcia by surprise, extending the Leon lead to 3-1. If Toluca (0-1-1, 1 pt) were to mount a comeback, they had to do so with 10 men starting in the 77th minute, when Fernando Uribe was sent off for a rash foul on Fernando Navarro. Ultimately, Hernan Cristante’s side failed to mount much of a challenge to avoid the winless start to their Clausura. Despite going behind early, La Maquina wasted little time with The Sacred Herd, scoring three consecutive goals to defeat their hosts 3-1. It had looked that Chivas would deny Pedro Caixinha his first win as Cruz Azul tecnico when, in the 34th minute, Carlos Cisneros opened the scoring, heading in a cross delivered inside the area. But in the 49th minute, Felipe Mora pulled Cruz Azul back onto level terms, converting a penalty that beat Rodolfo Cota. The penalty call, a caught foul that brought down Carlos Fierro, would be a subject of controversy later for El Rebano, when they saw penalty appeals for a similar tackle on Jose Macias waved away. The match looked to be heading to a draw. But in the 77th minute, a bombazo from Rafael Baca put La Maquina in front for the first time in the match. And in the first minute of second half stoppage time, Felipe Mora scored his second goal of the match off of a 2-vs-1 break to extend the hosts’ lead and cement the points. As for El Rebano (0-1-1, 1 pt), they have to wait until Jornada 3 for the next chance at their first victory. A brace by Nicolas Castillo and an opener by Matias Alustiza was all Pumas needed to defeat Atlas 3-1 to go top of the Liga MX table. In the opening phase of the game, it had not looked like Pumas would be the most effective team. Despite their possession and number of chances, the Zorros had found more dangerous chances themselves. But after a fifth minute goal by Nicolas Castillo, the auriazules were playing from a position of lead control. And in the 32nd minute, Matias Alustiza rubbed salt into his most recent former employers’ wounds when he extended the hosts’ lead to 2-0 from inside the area on a rebound that goalkeeper Christoper Toselli played directly into Alustiza’s path. Nicolas Castillo would convert a penalty in the 63rd minute to extend the hosts’ lead to 3-0, his league leading fourth goal of the Clausura. Atlas would not be without their own moment of glory. And in the game’s 76th minute, Ravel Morrison curled a direct free kick past Alfredo Saldivar to prevent the clean sheet. But the golazo, despite Morrison’s and the rojinegros‘ ability to generate chances on Alfredo Saldivar’s goal, was not enough for Atlas (0-0-2, 0 pts) to pick up their first points of the season. It would also be the last match for manager Jose Guadelupe Cruz, who was sacked after the match. Gerardo Espinoza Ahumada takes over the managerial duty in a caretaker role. The Rayados did not need to get into full gear to take apart the relegation threatened Tiburones Rojos 2-0 with what looked like a rotational side. While both sides had chances early on in the match, it was Alfonso Gonzalez who opened the scoring for the hosts with a rising finish from outside the area in the 33rd minute. The Tiburones Rojos looked to create more chances in the second half after they had introduced Omar Marrufo. But few of those chances seriously tested the Monterrey goal. But ultimately, in the 85th minute, Dorlan Pabon sealed the points for the visitors and quashed the efforts of the hosts to earn their first points of the season. Not all was good news for unbeaten Rayados (1-1-0, 4 pts). They lost starting goalkeeper Hugo Gonzalez to a leg injury, after he went down without contact in the 16th minute. Former Inter Milan goalkeeper Juan Pablo Carrizo took over for the former Aguilas‘ player and finished out the clean sheet. The Red Sharks have yet to register a goal in the league in 2018 despite claiming a point to their name. BUAP, Atlas, and Veracruz all occupy some of the bottom places in the Liga MX overall table after two games. However, there is a reason why the relegation battle comes with a mark of caution. There’s still a 62.5% chance that the team in last place in the relegation table stays up if they can afford to pay the $7M USD to the Ascenso MX champion who isn’t promotion eligible. There are caveats. Veracruz have a history of being at least a month behind on paying players’ wages that was documented in Clausura 2017 and may not be able to pay the fee if they end up in last place. And despite Lobos BUAP’s signings, the $7M that Lobos BUAP would have to pay to stay up is a larger chunk of their operating budget than it is for Queretaro or Atlas. Alebrijes de Oaxaca, the Apertura 2017 champions of Ascenso MX, could complicate the picture themselves because the championship has presented the club with an opportunity to expand their home ground to meet the 20,000 seat minimum capacity for Liga MX play. Alebrijes could simply find a way to make themselves promotion-eligible by presenting FMF and the Ascenso MX and Liga MX governors with evidence of their progress to a 20,000+ seat capacity stadium, and thus promotion eligibility to Liga MX. They would also have a good case, especially since Potros de UAEM were denied promotion eligibility despite meeting the minimum stadium capacity. While there was plenty of honors, we hand it to Fernando Navarro’s audacious sharp angle chip because of how surprised it took Luis Garcia when it hit, even though Navarro was only 1 on 1 with the Toluca arquero. Despite the loss, Atlas earned the honors for their brave performance in defeat. However, Cruz Azul and others raiding their defensive stalwarts and Rafael Marquez not getting any younger, it ended up being too little too late to save Jose Guadelupe Cruz’s job despite qualifying for the Liguilla last tournament. Ravel Morrison finally emerged as a protagonist for the Zorros and had earned it with a golazo. For the journeyman Englishman, it looked like Ravel started to play like the player Lazio bought from West Ham in 2015. But moving forward, they must anticipate better in defense the holes that teams will try to use to break them moving forward. Ya están listos los horarios, sedes y fechas para el siguiente Fin de Semana Futbolero ??? Three rounds in and the first major derby of Clausura 2018 is already taking place. The Clausura 2018 El Clasico Capitalino, which takes place on Sunday, January 21, will be the first big test between the two city rivals in which both teams were as high as they are in the Liga MX table in at least six months. It also has a chance for the Aguilas to spoil a potential 100% streak by their hated Mexico City rivals. It is a match that could see Jeremy Menez and Andres Ibarguen make their Club America debuts. But there are other big games on the docket. Puebla and Veracruz both would likely need wins to improve their position to safety, while Lobos BUAP travel to Estadio Hidalgo to try to claim their first win against the potent Tuzos attack. The Tuzos, without the injured center-back Omar Gonzalez, could suit the Wolves’ high-risk, high-reward approach. But Keisuke Honda’s deception and vision that proved to trouble the Aguilas in defense could complicate their plans for a first win. There are other partidazos that are coming surprisingly early, including two Saturday clashes between undefeated teams. First, Cruz Azul host Leon in a battle that the extreme optimists could see the debuts of both Landon Donovan and Carlos “Gullit” Pena for their new teams. Then, Monterrey host Xolos in their first league match without starting goalkeeper Hugo Gonzalez in 2017-18.